StrataFrame takes advantage of Visual Studio’s integration and extensibility features by enhancing the already rich development environment. StrataFrame’s type editors, control designers, and add-ins help to reduce development time and increase productivity. 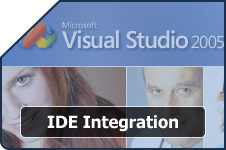 StrataFrame employs type editors, control designers, add-ins, and a VsPackage to provide complete IDE integration into Visual Studio. This integration increases productivity for the developer and reduces code required to control the functionality of StrataFrame. “Zero Code” can be used in many places where the developer would have to manually code a property. With a few simple clicks data binding, list population, and business object properties can be configured. StrataFrame comes with many integrated templates that help the developer create Windows and Web projects. Once a project is created, there are many additional templates to aid in the creation of forms and controls. For example, a StrataFrame Maintenance Form template will create a new form with a Gradient Form Header and a Maintenance Form Toolstrip already on the form, saving the developer some energy and creating a consistent layout. The Business Object Mapper is used to create and maintain the strong-typed field properties on each business object class. The Business Object Mapper requires no XML, UML, or XSD files for mapping information, but rather, acquires the schema information directly from the data store or from the meta-data used by the Database Deployment Toolkit. Through the Business Object Mapper, field properties can be customized to a specific data type and can even be serialized to an advanced data type.